TFW2005 has received official, high resolution images of Autobot Ratchet and Hot Shot with Jolt from the upcoming Transformers Universe Deluxe Wave 6 (2009 Wave 3) assortment. Official images of the figures and packaging can be seen by clicking on the Resource Database entry link for each figure below. Even though Ratchet doesn't look G1ish, I'm still gonna get him for my shelves. I really want to see a picture of just Ratchet only. to put up as my wallpaper. Ratchet will be mine oh yesssss. What….??!! Cant you tell i was being "smart-funny"! lighten up. But you gotta hand it to Hasblow's marketing and PR pps. This forum used to have a filter for "Hasblow", you know, so it's probably best if you refrain from saying that, as it makes you look childish. Ratchet looks amazing in package, but I will still wait for the HENKEI version. Hot Shot looks o.k. Ahh Hot Shot. He looks kinda weird with that mouth. I was very impressed with the prototype; the final toy by comparison is laughably bad. I understand that it's mistransformed, but the drop in quality and details compared to the prototype is just sad. It looks like a cheap knock-off of the actual figure. Are you referring to Ratchet or Hot Shot? If Hot Shot, I don't understand where it is that that you have a mistransformed pic to view. If you're referring to Ratchet, then either you are unaware that you are in need of some form of vision correction or you weren't using the form that you have when you viewed the pics. Is the pic of the final version in robot mode mistransformed? Unquestionably. Is the paint sceme bad? Enough so that it warrants the person(s) who decided on it being beaten with a very solid stick repeatedly. However, when viewing the pic of the mistransformed final version of the toy and the pic of the prototype that is right next to it in the gallery, I can definitely see more detail in many of the pieces of the final toy version. There is no appreciable difference in quality upon viewing, unless you're letting the awful color scheme act as the sole measure of quality in appearance. Response to other poster aside; I had wanted to like the new Ratchet. The biggest problem I have with it just can't be covered up with what little has been done to differentiate it from Ironhide. That problem is that his alt-mode isn't a medical vehicle. Combine that with how much repainting would need to be done to make a good paint cheme for the toy and I can't bring myself to shell out money for it. As for Hot Shot: I've never been a completionist, and I've never been fond of the character, either. This new toy doesn't have anything compelling to me, so no sale there, either. Oh well, there are plenty of other things that I have my eyes on. Wondering why Ratchet has that HUGE red section on his roof?? What was wrong with solid white? Why doesn't he have a gun? Does he fight Decepticons with loud noises and fist shaking? Both are looking good. The mistransformations are actually kinda funny, imo. There are a couple details about Hot Shot that are disappointed, though not so much that I won't get him. Would have been nice if the side windows were clear like they originally were, and it would have been nice for him to include the two guns he was at one point going to have. 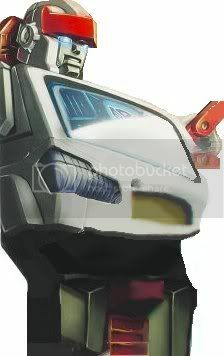 I actually like the red detaling on the hood of Ratchet's alt-mode. It actually looks good to me, and it adds some more detail in bot-mode. I also like the use of Prowl's light bar, and the red and blue paint apps on the top of it. Not the best mold, but definitely worth the buy. Oh … my .. god. WANTED: Two of these awesomesauce Toys EACH, PRONTO! Oh, and boo and shame on Hasblow's so-called pro photographers for mis-transforming the toys, which always smirks of laziness…. TakaTomy's are always TF-ed and Pictured Correctly! Shame on you Hasblow.. you never seem to learn! The Ironhide/Ratchet mold is incredibly flawed but I got Ironhide and I'll get Ratchet cause I'm a big fan of both of the characters. That head crest is getting painted black though. As for the JaAm boy, the license plate sealed the deal on him earlier. Definitely getting Ratchet. Hot Shot not so much. Here's a question, has Ratchet ever been portrayed as having his headcrest red and helmet white in any series other than somewhat in animated? Ratchet sometimes had a white head and red crest in IDW's comics, depending on which colourist was working on the issue or possibly how they felt that day when they coloured that papge. For example, in Devastation issue 1 and 2, Ratchet had a red head and a grey crest, but issues 3 through 5 give him a white head with a red crest… even though issue 1 through 5 were mostly coloured by the same artist! IDW isn't great when it comes to colouring consistency. It's a reference to Marvel G1 issue 70, "The Price of Life!"